With Halloween right around the corner, candy is on everyone's minds, well at least it is on my mind. I often find Halloween candy, save a Reese's or Snickers, to be too sweet and not very flavorful. I turned to David to see if there was a simple recipe for candy that was tasty as well as easy to make. 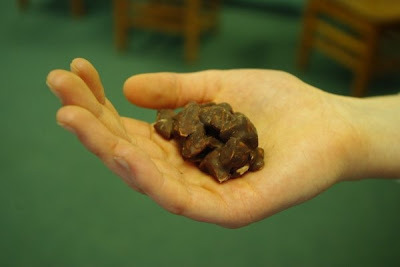 Of course he had a recipe that fit the bill: a simple chocolate and almond candy. What could be better? I snuck a taste as I made them, and boy were they good! As you can tell, these were perhaps even simpler than buying a big bag of Milk Duds and undoubtedly cheaper and more delicious. Trick or treat! Melt chocolate in a bowl set over simmering water. Stir in chopped almonds, coating them completely. Cover a baking sheet with parchment. Scoop out heaping tablespoons of chocolate-nut mixture. Sprinkle with sea salt. Refrigerate until ready to eat. Just learned about your blog at Helen's. This looks like such a fun experiment. I love good, toasted almonds. you just made my mouth water with this post.. All the best with the blogging endeavor.